There is a growing need to implement innovative, smart and integrated solutions that helps organizations to take fast, intelligent decisions and boost organizational performance. SAS has been the leader in offering market leading innovative solutions that deliver value and helps enhance business performance. Element delivers on the value of SAS and offers strategic, consulting, advisory and support services on SAS products. We leverage significant industry experience to enable organizations achieve revenue with higher efficiency. Element specializes in delivering SAS solutions to the Life Sciences, Financial Services, Retail and Convergent Media industry sectors. Whether you are seeking to customize a focused business solution, optimally configure core technologies or leverage SAS’ industry-specific expertise, Element will help you address your business and technology challenges. We provide SAS Enterprise Services to help achieve your business goals and maximize the investment in SAS technology. Element’s consultants have commendable hands-on experience and exposure in deploying SAS solutions in diverse environments. We continuously invest in our training capability and SAS innovation lab so that we can continue to contribute to the success of both our clients and our team. Element offers tailor-made evaluation of SAS products and its usage within an organization. Through SAS Assessment, organizations can increase the value of their SAS solutions and determine ways to realize greater ROI in their licensed SAS assets. Fast paced requirement gathering and project assessment will enable organizations to experience the power of SAS technology in the fastest way. Element Consultants address the inefficiencies in managing data, application development and processing by chalking out ways to make the most out of the SAS product suite. We collaborate with your IT professionals to expedite the installation and integration of your SAS software. 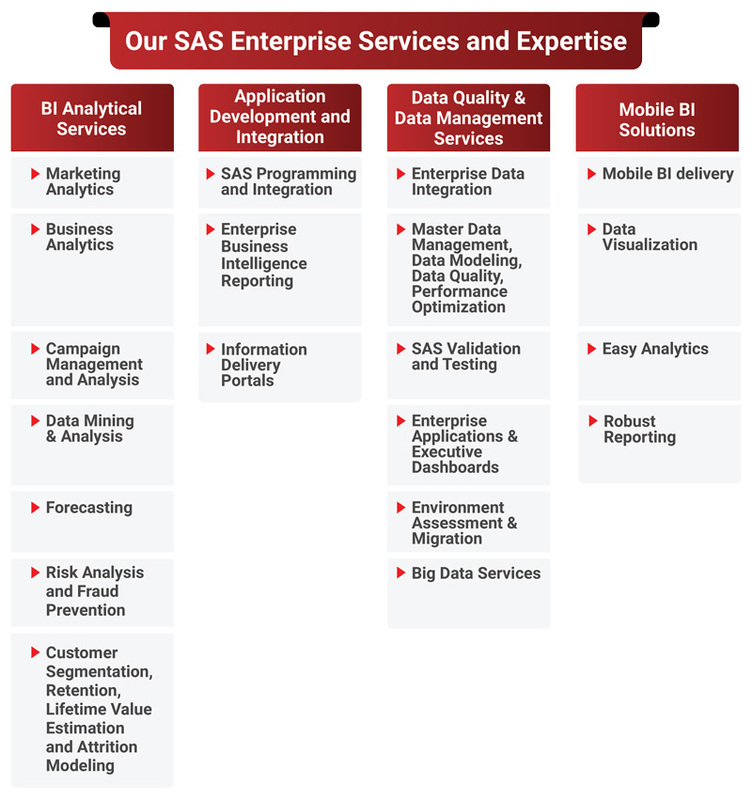 Leveraging our industry aligned expertise to effectively deliver SAS technologies and solutions so your company can obtain the benefits of your SAS investment. Element’s SAS advisory services help clients to identify potential opportunities to maximize the value of SAS investment and align our solutions with your evolving business and operation challenges while delivering high-quality services. Whether it is implementing a new solution or, upgrading to a new SAS version or migrating to a new environment, all require detailed planning. Your plan must consider how the change will affect your environment; impact your current applications, and how your new solution should be configured to achieve maximum performance. Elements’ team of professionals guide you through the installation, upgrade, migration or conversion process. We implement the right solution, based on industry best practices. As each installation, upgrade, migration or conversion project has its own individual characteristics. Element follows a process to ensure a repeatable and successful experience to give you maximum ROI.